The Megillah introduces Mordechai to us in the following manner, “Ish Yehudi – a Jewish man lived in Shushan Habirah - the capital city, whose name was Mordechai….” There are a number of interesting angles on this intro. Firstly, Mordechai was not from the tribe of Judah, yet he is called a Yehudi - Jew (the Megillah is the first time the term Jew is used to describe the nation of Israel as a whole). Also, there is an emphasis on his place of residence, Shushan Habirah. We meet Shushan earlier in the story when it describes King Achashverosh and his feast. We already know that it is the capital of Persia. Why the need to emphasize it again? Our sages explain the use of the title Yehudi as being associated with one who is firm in his commitment to Hashem and rejects the worship of a foreign deity. Mordechai refused to bow to Haman and his idol thereby earning himself the title Yehudi. He then encourages and persuades the entire Jewish people to remain firm in their commitment to Hashem. There are degrees of commitment to Hashem. There are those who are willing to be a Yehudi in the Synagogue. They will pray and study and observe Mitzvahs. But when they leave Shul they put the kippah in the pocket, and kiss the Mezuzah and G-d goodbye for a while. Others are willing to extend the commitment to their homes and Jewish settings. They will keep Kosher and Shabbat. They will recite blessings over food and give Tzedakah. If a Rabbi comes to visit the office they have a kippah ready to wear for the occasion. But when outside among society there is no need to stick out and act differently. Mordechai was exemplary in that he was a Yehudi even in Shushan Habirah. Shushan was the capital – the place where Persian society was at its strongest. The feast narrative tells us all we need to know about the culture of Shushan. Nevertheless, Mordechai was a proud Yehudi even in Shushan. That is the kind of example he set and the leadership he demonstrated for the Jewish people. We are all Yehudim now. We are all inspired by the model of Mordechai in our devotion to Hashem. Let’s make sure that we are Yehudim even in Shushan Habirah. We can be proud visible Jews, while being comfortable on the streets of the French Quarter (most of them anyway), in the halls of Capitol Hill in DC, and the highest skyscrapers in Manhattan. 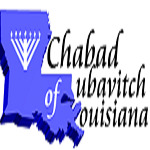 On behalf of all of the Shluchim of Chabad of Louisiana, I wish you a very joyous and meaningful Purim. Please join Chabad at one of the many events listed below.